China's death toll from tropical storm Bilis more than doubled to 482 on Friday after a hard-hit province reported a sharp rise in fatalities, the official Xinhua News Agency said. Authorities in inland Hunan province said 346 people died in floods triggered by Bilis, while 89 others were missing, according to Xinhua. The province had previously reported 92 deaths. Bilis slammed into China's southeastern coast on July 14 and churned inland, setting off flooding and landslides and forcing nearly 3 million people to flee their homes, according to the government. The higher death toll in Hunan included 197 deaths in the village of Zixing, Xinhua said. It said a reporter from state television found that the Zixing government apparently underreported the number of deaths. Chinese officials frequently are accused of hiding accident deaths and other unfavorable information. Phone calls were not answered Friday evening at Zixing's government office or Hunan's flood prevention office. Also Friday, the Ministry of Civil Affairs issued a warning to local authorities that they would be punished if they fail to report disasters accurately. The death toll in crowded Guangdong province, which borders Hong Kong, rose Friday by 19 to 63, while the toll in neighboring Guangxi province rose by one to 30, Xinhua said. It said there were 43 deaths in coastal Fujian province. Losses in Guangdong totaled $1.1 billion, the report said. Flood waters washed away roads, cut power supplies and submerged part of China's main north-south railway line in a swath of destruction that stretched across southern China. Storm-ravaged areas faced new problems this week as a heat wave swept the region, with temperatures in Fujian on Thursday rising to 100 degrees, Xinhua said. Separately, Xinhua said flash floods struck a county in China's mountainous southwest on Friday, killing at least eight people and leaving 27 others missing. 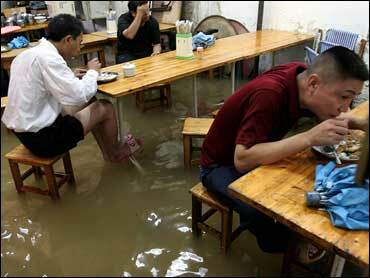 The floods swept through a town in Mengzi County in Yunnan province early Thursday morning, Xinhua said. Work sheds beside an expressway that was under construction were swept away, the report said. It didn't say whether anyone was in the sheds, but Chinese construction workers often live at the site of building projects.